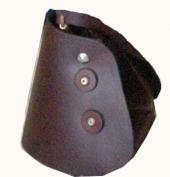 Replacement stirrups for the M&W Trooper Saddle. Plastic stirrups covered with leather. Available in Black or Havana. Also available in Extra Large Wood Stirrups for $20.00 extra.